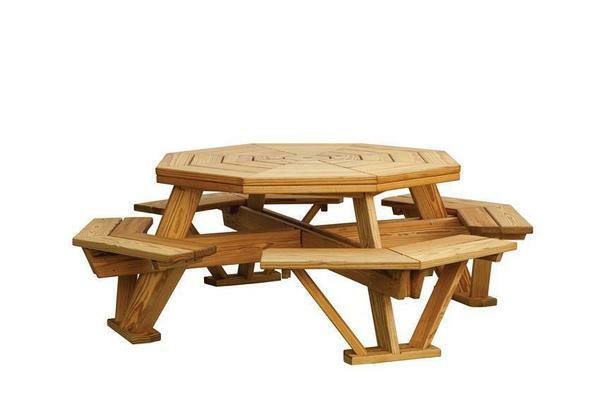 This Octagon Picnic Table with Benches offers plenty of seating space for a family of eight! The photo shows our larger picnic table which can seat 8 adults comfortably. Our smaller picnic table can seat 8 but it will be a bit cozy. Octagon tables are great for conversations and intimate dining since you are facing each other. This wood picnic table is a perfect choice for your backyard gatherings and will create a cozy outdoor dining room. Outdoor dining is the main use for a picnic table even romantic, candlelit dinners under the stars with wine, chocolates and some grilled steak. Consider placing some lanterns, candles and accent lights in your outdoor living space to enhance the ambience in the evening. Don't be afraid to bring out the china and crystal for an elegant outdoor dinner party. Picnic tables offer a comfortable spot to play family games including board games and cards. A family favorite for Jim Miller, the owner of DutchCrafters, is the card game Euchre with his wife Linse and their four children James, Alex, Alysa and Brielle. Picnic Table Crafts with the little ones (or big ones) such as painting and tie dyes. We do offer outdoor kid's furniture as well. Many enjoy relaxing and maybe reading a good book as a family such as Little House on the Prairie by Laura Ingalls Wilder or Skippyjon Jones depending on the ages. Outdoor tea parties in the garden for the little ones and the adults. Perfect spot for guests to sit during a party outdoors. This Octagon Picnic Table will help you create the perfect party space in your backyard. Many choose to decorate their garden around a picnic table so they can experience nature's beauty right in the backyard. You and your guests can admire your herbs, vegetables and flowers growing nearby while relaxing at the outdoor table. You may even be lucky enough to enjoy their aroma. Since your table will be the focal point you may choose to go with a green or brown neutral color for the stain or paint. You may also consider place the outdoor table under the shade of a big tree, beneath a pergola or colorful umbrella. Picnic tables are a given at restaurants with outdoor dining, campgrounds, parks and even colleges and universities. Our Amish picnic tables are a popular item for our furniture trade sales especially for hospitality outdoor furniture and outdoor restaurant furniture. Check out our business profiles to read about some of the sales we have had with our business to business customers over the decades we have been in business. Call one of our Amish furniture specialists today with questions or ordering assistance on our outdoor furniture. You can reach them to find out more about our picnic tables at 1-866-272-6773 or questions@dutchcrafters.com. If you are in Florida head over to our brick and mortar store for assistance. Top (Point to Point): 45"
Height Ground to Seat: 17 1/2"
Top (Point to Point): 57"
No Umbrella Hole - Note if you order this option lead time will be longer. We ordered two octagon picnic tables for our deck. They are absolutely gorgeous and we are constantly receiving compliments. There was an issue with the trucking company and customer service took the bull by the horns and resolved the problem. Customer service has ALWAYS been cheerful and a pure pleasure to deal with. We will...and do...highly recommend Dutchcrafters to all those who compliment us on our tables.